Known from two subpopulations on a single mountain top (EOO <20 km²). Subjected to severe ongoing overgrazing and frequent fires. Mistbelt grassland, on cool, shady, south-facing slopes of granite outcrops, often in crevices and pockets of soil with moss. Nkandla Mountain is surrounded by rural settlements and the grasslands on the mountaintop are used as communal rangelands where large herds of goats and cattle are causing severe overgrazing and trampling (C.R. Scott-Shaw pers. comm.). As a result of too-frequent burning, heavy grazing pressures and soil erosion, the plants have declined sharply in numbers over the last 20 years. The optimum habitat, consisting of steep, grassy banks below cliffs has now largely been degraded and taken over by weeds and other pioneering vegetation. The species is now confined to the least suitable habitat and may disappear from much of this too, particularly under conditions of global warming (Craib 2005). 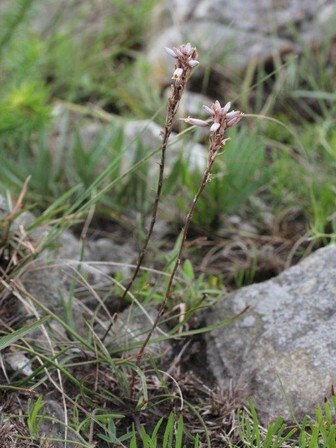 Known from two large, relatively isolated subpopulations on Nkandla Mountain, each consisting of 500-1000 individuals (B. Church pers. comm. 2007). Not currently conserved in any formally protected area. Reynolds, G.W. 1947. Genus Leptaloe Stapf. Restoration to Aloe Linn. Journal of South African Botany 13:101-103.